A few months ago, a friend of mine who was curious about the nuances of Indian culture asked me to explain the artistic differences between North and South India. I realized it was a loaded question, and I could only give him a general overview of similarities and differences between north and south, Aryan and Dravidian, and Central Asian, Persian-Turkish influences versus Burmese and Sri Lankan. I felt I had a vague generalist understanding of my country of origin, though my answers seemed to satisfy him. It is exceedingly difficult to encapsulate the cultural diversity of the Indian subcontinent, spanning across India, Bangladesh, Pakistan, with a cultural nebula across Burma, Sri Lanka, and Thailand. To travelers like the seventh-century Chinese Buddhist monk Xuanzang (the 14th century Central Asian [Uzbek] warrior), the marauder Timur (the subject of Christopher Marlowe’s Tamburlaine) and even Mohandas Gandhi, returning from years of living among the racist Boers of South Africa, India remained a baffling and exotic mystery to the intellect and senses. 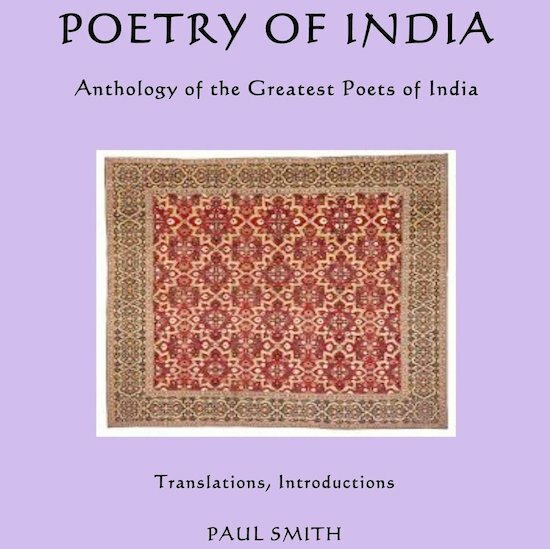 Fortunately for us, a book like Paul Smith’s massive anthology, Poetry of India: Anthology of the Greatest Poets of India, gives curious readers of Indian culture and literature an adequate place to start. Paul Smith is an Australian poet and scholar of Indian and South Asian literature. He has translated the works of Rumi, Hafiz, and Nizami, as well as the works of various other Sufi and Persian poets. In this anthology, he delves straight into the complexities of Indian literature, Sanskrit poetry from South India and the Deccan states, medieval Tamil poetry, and poems by well-known nineteenth and twentieth-century poets like Makhfi, Ghālib, Tagore, and Iqbal.